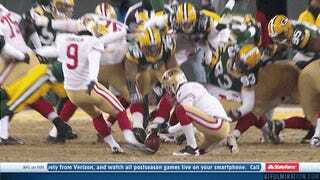 Joe Buck and Troy Aikman might have underplayed how close the 49ers-Packers game was to giving us extra football. Phil Dawson's game-winning kick went through Davon House's arms before it went through the uprights—though House may have been was offsides—as San Francisco won in Lambeau Field, 23-20. But San Francisco's quarterback had a better day. Colin Kaepernick worked well as a dual threat, throwing for 227 yards and a touchdown while also rushing for 98 yards. Frank Gore added 66 yards and a score, and Michael Crabtree took apart the Packers secondary with eight catches for 125 yards. The Packers kept it close, as was assumed with Rodgers, but the 49ers' defense held up well, and now, we'll watch Colin Kaepernick and Cam Newton scramble around frequently (hopefully) and do crazy things in a much warmer place.